As an acclaimed environmental poet, her poetry will resonate in a native garden with views to the sea and habitats for birds. 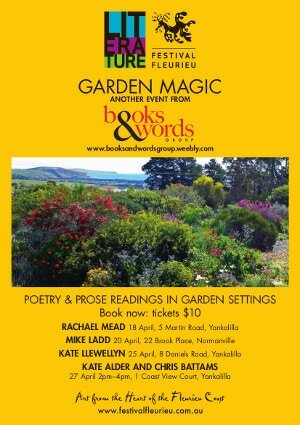 Caroline and Peter Weatherstone’s native garden with habitat for birds and views to the coast will be an appropriate venue to host Rachael Mead, acclaimed environmental poet from the Adelaide Hills. Much awarded for her three poetry publications, she’s been an archaeologist, environmental campaigner, wedding decorator and bookshop manager—and earned a PhD along the way. Renown SA poet and host of Poetica will read from his awarded body of works in a walled courtyard, in a garden with spectacular seaviews. Mike Ladd, host for many years of ABC Radio National’s Poetica, has many publications of his much awarded poetry. This broadcaster and renowned teacher of poetry writing has developed a body of poetry with a very South Australian flavour, and has also lived and worked overseas writing and broadcasting. His readings will take place in Maurene McEwen’s garden with its enchanting walled courtyard, and terraces which treat you to spectacular sea views. South Australian treasure, Kate Llewellyn, makes and writes about gardens wherever she lives. Her many books of poetry and prose, often grown out of journal and letter writing, are entwined with a love of gardening. Peter Fitzgerald and Lorraine McLoughlin are delighted to have Kate read, talk and answer questions in the rambling garden they have created around their 150 year-old stone cottage. Two local poets who perform and publish poems, bring their literary energies to you in a developing garden with views to the gulf. Kate’s published poems, and her popular performances of them, have all been praised for their musicality, tight crafting and witty twists. Chris has taught and performed his poetry in Australia and overseas, and has been published in national and international journals. Hear them both in Winnie Pelz’s new garden with its view to the gulf and where her vision is evident as the structure emerges and eclectic plantings indicate increasing delights to come.